These Diamonds are a true value. With these Diamonds, we can offer a much bigger Diamond, for half of the cost of a "Non Treated" Diamond. Treated Diamonds are natural Diamonds that might have had a visible flaw at one time. Through this process, we send the Diamond to one of our gemological laboratories in Israel, where they take a microscopic laser and "hit" the visible flaw with the laser. Through this process they are able to make that flaw no longer visible. The end result is that you now have a Diamond that had a flaw to begin with and therefore had a lower cost; however, now the flaw is no longer visible but still holds that lower cost. This is a true value for someone who wants an amazing Diamond but just doesn't want to spend a ton of money! 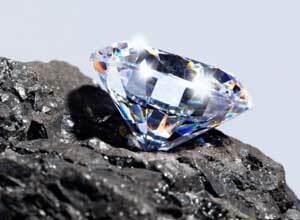 We are able to sell a 1 carat Diamond for $1,500 that otherwise would cost you $3,000. We also can sell an amazing 2 carat Diamond for $6,000-$7,500 that otherwise may have cost you $15,000. Of course we have bigger Diamonds, smaller Diamonds - better clarities, lesser clarities and in all price ranges. Whatever your range is, this is a true value and a great alternative to spending thousands more elsewhere!